Ferrets may get adrenal disease, lymphoma, hypertrophic cardiomyopathy, and insulinomas, but they can also be affected by other less commonly seen problems. Gastric dilatation-volvulus, more commonly referred to as bloat, is one of those not so common problems that will occasionally affect pet ferrets and it is one that needs timely treatment. Bloat, gastric dilatation-volvulus, gastric bloat syndrome, or GDV is a serious, life-threatening problem that acutely affects the gastrointestinal tract of your ferret (it also occurs in dogs). Bloat occurs when gas or air builds in the stomach. When this gas doesn't pass through the intestinal tract or back out of the esophagus and mouth, it puts pressure on the stomach wall and will cause perforation (tears in the stomach), cardiac arrhythmias (irregular heartbeats), shock and more. The gas not passing can be caused by a lack of gut motility (ileus) or more often volvulus. The volvulus part of gastric dilatation-volvulus happens when the bloated stomach turns or twists (called a torsion) and cuts off access to the small intestines (specifically the duodenum) and the esophagus where the gas is supposed to escape to. Bloat doesn't always have a torsion (the volvulus part of the name). It can just be gastric dilatation and then turn into a gastric dilatation volvulus and the torsion part is the true emergency. 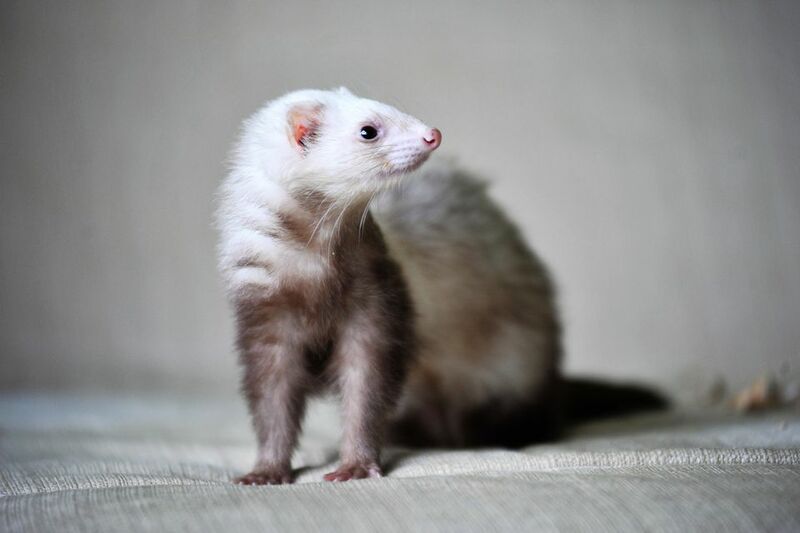 There is a discussion that a bacterial overgrowth of an anaerobe called Clostridium in the intestines of ferrets can produce enough gas to perpetuate bloat and subsequently GDV but that isn't the only way it can happen. By gulping air a stomach can fill with air, become distended, and then twist as well. It is also known that a diet high in carbohydrates can increase the likelihood of bloat along with a 24 hour fast prior to allowing your ferret to overeat and is noted more commonly in weaning ferrets. Ferrets that have bloat or GDV need immediate treatment. Your exotics veterinarian will first take radiographs (x-rays) of your ferret to confirm the bloat and to see if the stomach has twisted. If the stomach is bloated your vet will most likely decompress it by using a large-gauge needle and inserting it directly into the stomach through the side of your ferret's abdomen. This will allow the gas to escape, releasing the pressure in the stomach. He may also try passing a tube down your ferret's esophagus to allow the gas to escape that way. If the stomach is bloated and twisted (GDV) your ferret will most likely need emergency surgery to untwist it as soon as possible. Medications for inflammation, pain, gut motility, and to cut down on gas production may be prescribed as well as IV fluids. If your ferret is suddenly lethargic and his abdomen seems enlarged he may have bloat or GDV. GDV can also cause a change in gum color, an increased heart rate, shock, and difficulty breathing. If you suspect your ferret has bloated do not wait to get him treatment. You can do your best to prevent bloat and GDV by feeding a high protein, grain free kibble (such as EVO) or a whole prey diet like chicks. You can also make sure your ferret is eating throughout the day and not having food withheld from him for extended periods of time. What Kind of Diseases Can Pet Ferrets Get? What Is a Raw Diet for Your Pet Ferret? What Can My Pet Ferret Play With? Does Your Pet Ferret Have a Tumor? Are There Different Types of Pet Ferrets? Does Your Ferret Have Diarrhea?